Anyone think that the code update would be coupled with a vault release? Would not surprise me if they piled it on top of a re release to build momentum and chatter. I was in on this early put my order in with the fall before the release when I first got wind of the rumor. Still a grail title for me so I am in for the long haul. Stern will deliver much like Kiss I think we will be happy in the end. I don't think it's a game-breaker. On the first ball it nets you 1M points...so what. The real advantage is starting the mode right away...but it locks you into WBTD. I much prefer the librarian scoop ladder skill shot. Two modes and I'm in WCWS. All of these scoring "exploits" or imbalances have a risk/reward/opportunity cost to them. You have to make them, and then you have to take advantage of them. They're not gimmes. Agreed. A few of my regulars can do the plunge exploit on demand, but few ever do it at all because it's not really a great advantage if its restrictions don't fit with your strategy. Besides, I can hit WBTD on the fly as it comes around the orbit 80% of the time. Does messing up the plunge thing lock you into something if you mess it up a certain way? Correct. And I believe on Ball 1 you get 1mil + WBTD mode start. Balls 2 and 3 I think are +10% of your score. Does messing up the plunge thing lock you into something if you mess it up a certain way? I'm not sure you can mess it up. You just have to keep short plunging and trying to time the long plunge over and over. I believe you can keep trying it forever. The only two final outcomes I know of are 1) you make it work, or 2) you short plunge too long and it falls off the shooter lane. But if you don't flip or hit any switches, it'll drain and load the ball back in the shooter lane. I've never seen anyone hit the second plunge hard enough to get into the pops without going all the way around. I don't do it, mainly because I just don't want to. Getting good at double plunging won't make me a better player. And that's what I really need! Ha! I agree with you there. Being a pro at that exploit will not help me win very many more games. In the recent city championship, I put up 170ish million on ball 3 after everyone was in the low teens after ball 2. As second player I was feeling pretty good and had 1 point in the bag and just needed GB to do its thing and I was sitting on 4 points. Nope. Player 3 put up 300-something on ball 3 and player for did 200-something. Pretty strong game on my part considering what we all did after 2 balls, still end up in third. I don't need to blow the game up every time, just get better. No. Just...NO. Stop, right there. There is no "just accepting" it. Dwight hasn't even started on polishing. The code is probably untouched since his release in January 2017. Worse then that, Dwight seems to not even know what is bad with the code according to his podcast interview. It's partially due to many of us having spent thousands of dollars for a game that still hasn't had its code completed after nearly 3 years. 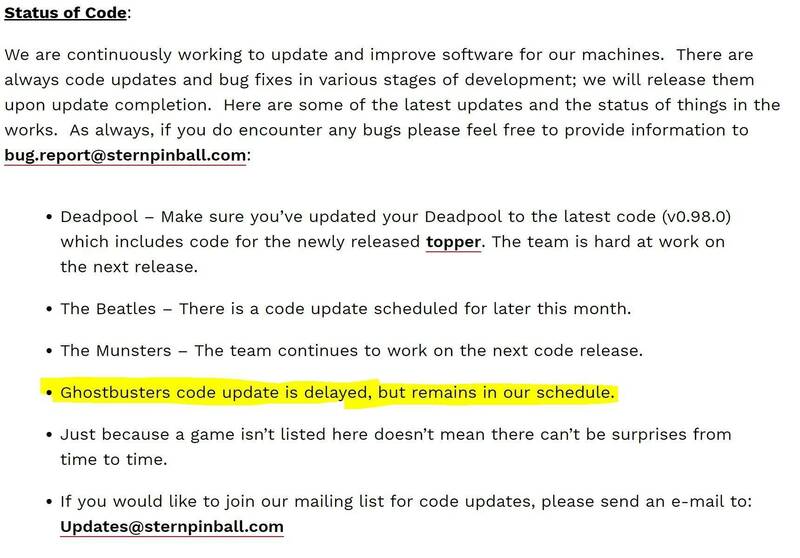 Stern also said they didn't forget about GB code.... 26 months ago. That's good news, but it was also coming after Star Wars. After listening to Dwight’s last interview it sure sounded like absolutely nothing has been done at all. He stated he was not even going to touch it until Munsters was done. While I hope he is messing with us all, I highly doubt it. Yeah, he's not working on it until Munsters is done which probably won't be that much longer. Dwight also mentioned in the podcast that he's the next programmer in line to roll off a project who will then have time to work on other items. He mentioned that other programmers have been able to work on other items as they had a break between games, Dwight is about to get that once Munsters is done. He seemed more interested and less aloof when talking about getting to work on GOT compared to Ghostbusters. Yeah, sounds like GOT is done beyond bug fixes but who knows. GOT may always feel incomplete to some as the game code only includes content up to I believe the 4th season versus code being added as the show has gone on. I've always been hesitant to buy pins that are released while a show or movie trilogy is still on going as companies tend to never go back and add code from the remaining seasons / movies. 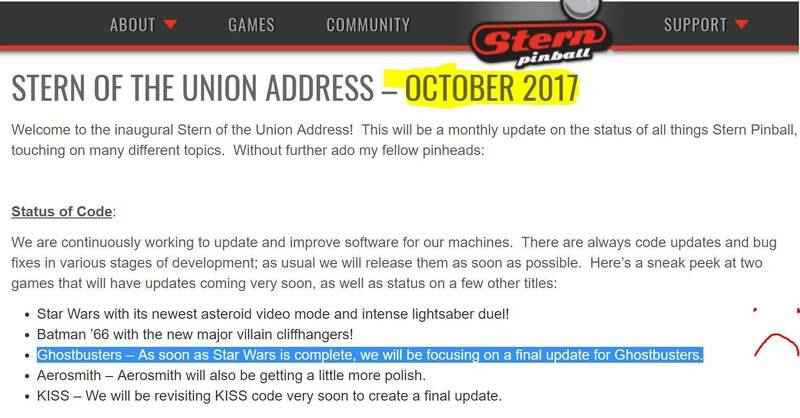 I'm thinking that finishing Ghostbusters code will be at the top of Dwight's list after Munsters is completed considering Stern has now been telling customers every month since their first Stern of the Union address in October of 2017 that an update is coming. 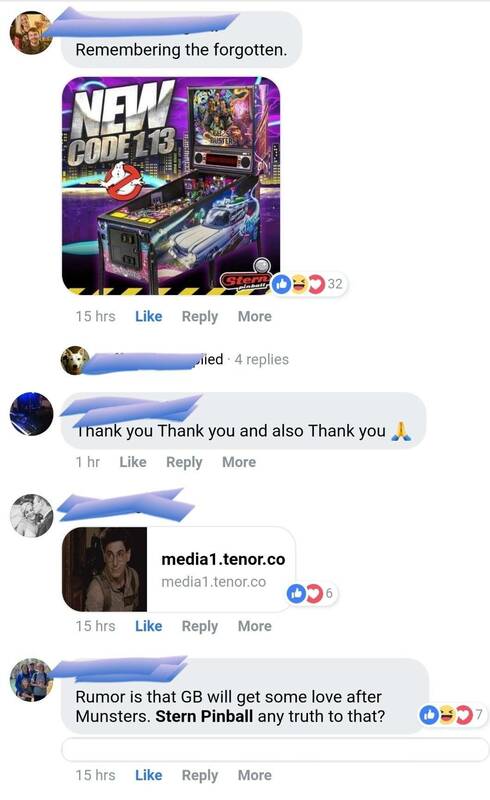 Every non Ghostbusters code update post that Stern makes on Facebook at this point is bombarded with comments about Ghostbusters code and Ghostbusters memes lol. and ranting weekly while tapping your foot is going to make the code appear any sooner? If you're good enough to consistently make it to the dead end road of this game's code, then what had anyone thinking that road was going to be finished soon after the game's release? People were lined up with cash in hand even after non-code related issues came out in waves. Go play outside this summer, time will pass and maybe the code will be released before the holidays. and ranting weekly while tapping your foot is going to make the code appear any sooner? Ranting, nasty emails, boycott threats, class action suits, and protests at the factory. Pretty sure the desired outcome is for Stern to go back to not communicating their plans with the public again. After all, anything they say WILL be held against them. "When Munsters is done I will work on other things, not making any promises, Ghostbusters will definitely get some attention at some point"
Mike was asked at TPF during the seminar where the code was and he said it’s coming. More of the same. Stay tuned I guess lol. True to my word I have not bought nib box since gb..
My guess is the FB release post of BK3 will be flooded with GB memes. New GB code would be fantastic! March "update"...sadly there isn't a new update, more of the same Now 27 months and counting. The wording isn't encouraging. BM66 update is "in the works". GB is just "on our schedule". That sounds to me like they haven't started anything yet. So neglected it doesn't even get a hyphen. Talk about being ignored. My disappointment runs deep. So sad that he refuses (based on past podcasts) to admit this title is far from done. Normally, I would have dumped the game...Since it is still a ton of fun for me and my family, it stays. For the future, I'll never own another Dwight game again. Munsters was largely disappointing in the code dept; luckily nowhere near as bad as Ghostbusters. They should just admit they're not going to update the code. At this point it's kind of insulting. I called stern today about my playfield issue they were pretty rude. My distributor seem to be draggin his feet on issue so i called them, and the way they acted was not cool. I've emailed them a few times over the list couple years and they've never been helpful. No wonder they need distributors. They have no idea what customer service is. I fought w/ Stern for over a year before I finally qualified for a playfield replacement. I didn't care for the way I was treated by Stern. I installed the new playfield in October, 2017. To this day, it hasn't had a single ball played on it. I have to assume Dwight is still working on Munsters full-time. The key is whether they schedule a breather in for him for GB before the next pin project is assigned. 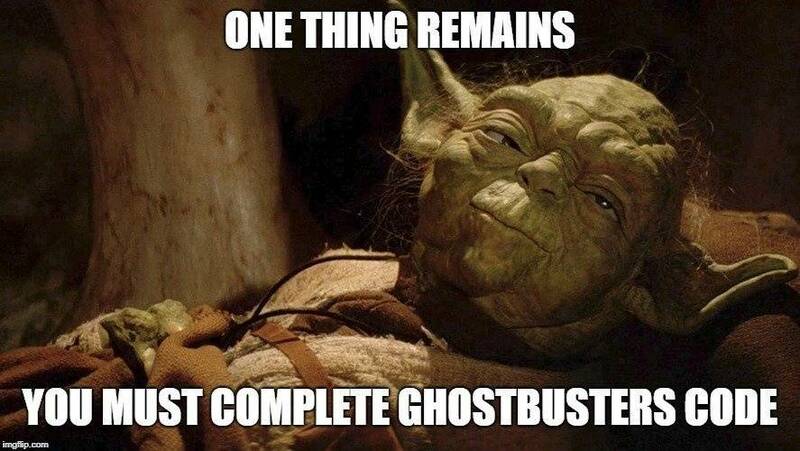 He obviously went from Star Wars to Munsters with no break. He obviously went from Star Wars to Munsters with no break. 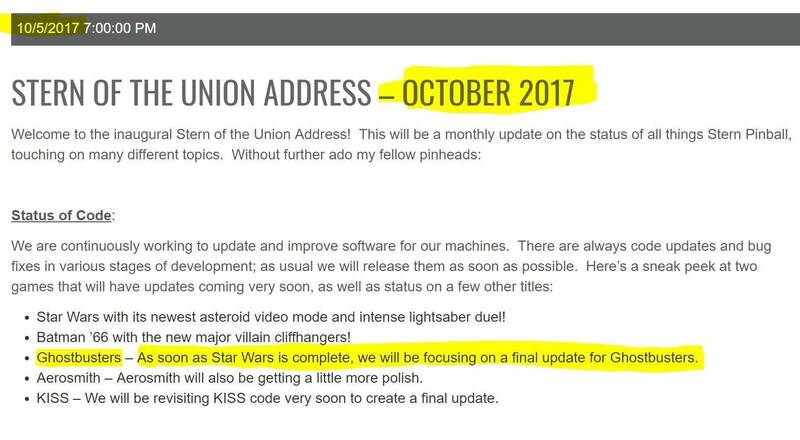 Look at what Lyman puts out at each update and then look at what Dwight does each Munsters update. Easy to see who is just drawing a paycheck and who actually is passionate about their job. Lyman is all about the hobbyist experiencing each title to the fullest. No doubt he is the most dedicated programmer out there! 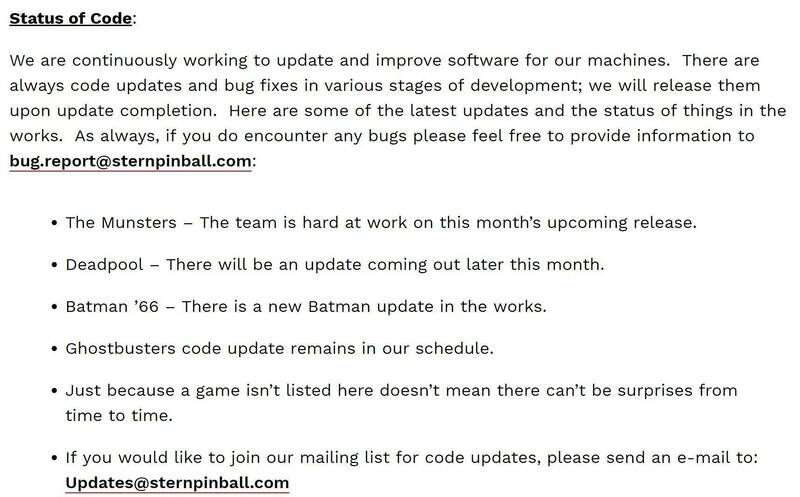 I still feel that if Stern can properly complete the code for Ghostbusters that the game will be one of their best pins. The theme is timeless as well as iconic and deserves to be fully brought to life with deep and complete code. The game has a lot going for it. Once you take care of the air balls and rail hopping it plays really well. Just needs great game code. 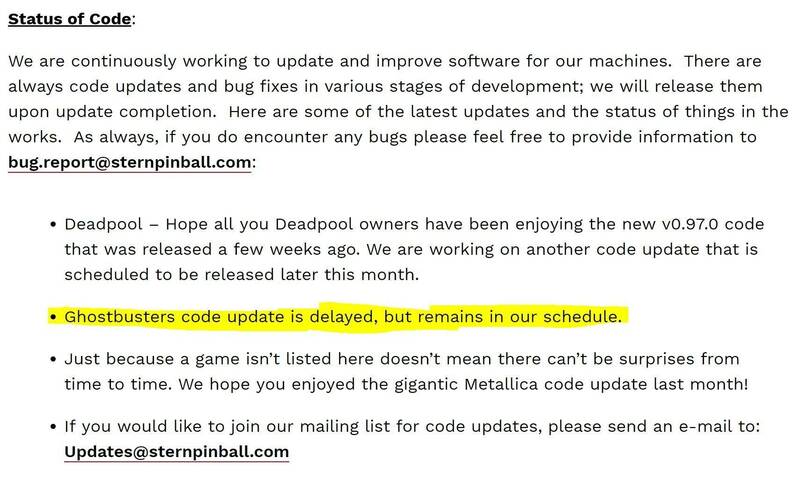 Other than Stern said they would, why should we think they'll update the code for a game out of production? What do they have to gain? Future customers confidence, that if they buy a game, it will be completed at some point. Still looks pretty bad to have delayed it this long even if they do come through. Hard to see the investment being worthwhile when they already look bad. Because they do it regularly...Kiss just got one. 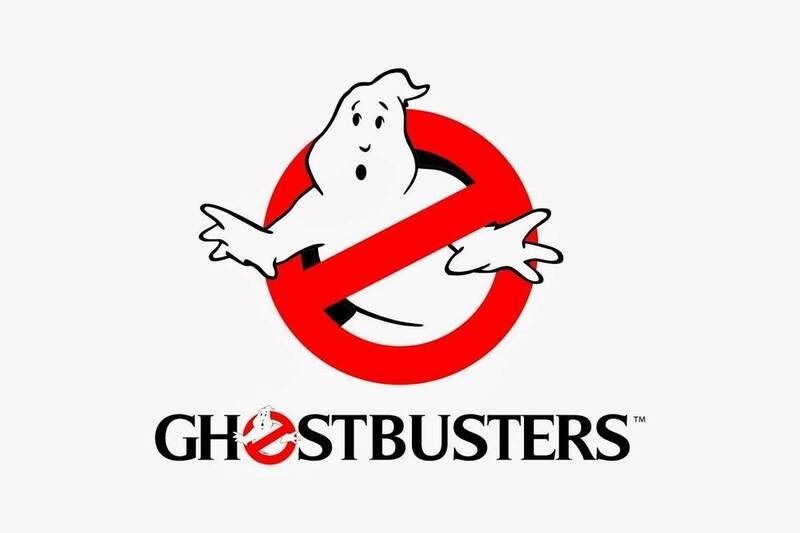 I wouldn't expect to see anything Ghostbusters from Stern untill 2020. To coincide with the movie. Well, it's the only way I will ever be calling my distributor again asking him to put me down for a new Stern. That customers will continue to buy their games and not tell others to avoid Sterns due to lack of code support. Personally I refuse to buy another NIB Stern until Ghostbusters code is completed. As a result I just bought a new JJP Pirates instead. I would love to buy Munsers but won't because it is Dwight coded and there are many others with the same thought, so it does affect Stern and it is in their best interest to complete and debug games otherwise people lose confidence.